The Telltale Games version of The Walking Dead was my personal favorite game of the year, and I was encouraged to hear similarly positive things about The Wolf Among Us this year. Like TWD, TWAU is based on a popular and long-running comic book series, in this case Fables. I read much of Fables a few years ago and had generally positive but somewhat mixed feelings about it; given how much TWD exceeded the quality of its source material, though, I had high hopes that TWAU would similarly rise above the comics. Fortunately, that proved to be true. For the most part, at least. Fables is a sprawling and epic series; as with many successful epics, it starts off with several arcs that have lower stakes and introduce you to the world and its characters, before blasting off into more universe-shaking storylines. TWAU is a prequel to the comics, and its structure and tone generally follows the mystery-story format of the early Fables books, in contrast to the more adventure-story-esque style of the superior middle sections. And, for what it's worth, I enjoyed the story of TWAU more than the corresponding mysteries in Fables. It's a fantastic full-on piece of noir, with a tight central plot, corruption, many shades of gray, and a fantastically faded, dingy, neon-tinged portrayal of 1980s New York City. I was also impressed by how well TAWU differentiates itself from TWD, both in content and in gameplay. On the surface level, they appear rather similar. You control a single character, you occasionally move around by tapping on the screen, most of the gameplay consists of dialogues where you much select from four possible prompts before time runs out, you manage a small inventory, and complete action sequences through quick-time events that require tapping or sweeping on the correct parts of the screen. However, the feel of the gameplay turns out to be very different, which is very appropriate to the source material. TWD is ultimately a survival horror game, and you spend much of your time either fleeing from danger, recuperating with other survivors, or trying to shore up your defenses for the inevitable next assault. In contrast, TWAU is a noir mystery: you have a fair amount of power in your own right, and the focus is much more on investigating, convincing witnesses to open up to you, connecting the dots and drawing conclusions. It also seems to be a bit easier than TWD, or maybe I'm just getting better at these games. In any given episode of TWD, I would often die once or twice during particularly gnarly zombie encounters; in TWAU, I don't think I lost the game a single time. Again, this fits well with the theme of the game: TWD should emphasize your helplessness, while TWAU tries to emphasize the consequences of your decisions. As with its predecessor, you have a fantastic range of role-playing choices at your disposal. They extend beyond the expected "good cop" and "bad cop" portrayals, and you also get occasional options to express the motivation behind your actions: if you refrain from killing a mortally wounded man, is it because you wish him to suffer, or because you're unwilling to become a killer? If you lash out at a suspect, is it because they've enraged you, or because you're trying to make them spill some information? 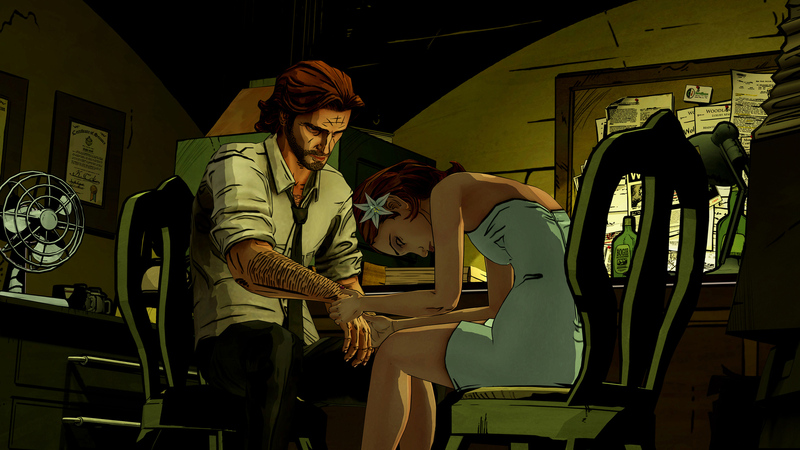 Only a few of your choices actually change the flow of the story, but most of them helped shape my personal concept of Bigby and his relationships with other characters. TWAU includes a mixture of existing characters from the comics and new characters for the game. I liked both groups; the existing characters were very recognizable and felt continuous with their comics portrayal, while still feeling free to breathe and not totally tied to their precise look. (The difference in time probably helps this as well; Fables don't age, but they can change their style over the decades between the game and the comics.) The new characters also made a lot of sense, and in some cases I was a bit surprised that they hadn't already been included in the sprawling cast of the comics (why didn't it already include The Little Mermaid or Grendel or the Woodsman?). In a few cases, I actually felt like the game might be even better for people who hadn't already read the comics. It fits better chronologically, since it takes place first. The game also includes several surprises and twists that, if you know what happens later; lose their impact. The most obvious example is probably Snow White's head being found on the doorstep at the end of Episode 2; that should be a shocking scene, but it was impossible for me to take seriously since I know that she can't be dead. I also sometimes felt like I had unfair information when conducting my investigation. For example, the portrayal of Bluebeard is excellent, giving the same sense as in the comics that he is up to something but not able to prove exactly what; but I knew that he couldn't be the villain, since that would have prevented him from holding the role he does at the start of the comics. That said, the game as a whole felt very open: you know that several of the main characters will live, but not much else, including who the ultimate villain is, how the case will be resolved, how much death there will be along the way, etc. As is often the case for me, while I enjoyed the flexibility around combat and intimidation, my favorite parts of the game had more to do with political wrangling and social engineering. It felt fantastic to have a game that culminated in a (very tense!) courtroom drama scene, with careful marshaling of facts and counter-arguments, rather than in fisticuffs. I also really enjoyed your (potentially) more tender interactions with other characters; as with The Walking Dead, there aren't any full-blown BioWare-style romances, but the game does give you several choices in how you relate to other characters that nicely set the stage for affection or frigidity. My timing is pretty great, since the final episode of Season 2 of The Walking Dead just came out, so I'll probably pick that up before too much longer. I've been waiting a long time to see what horrible things happen next in that grim saga, and I'm happy to have enjoyed a marginally more uplifting (and genuinely enjoyable, well-done) adventure before returning to the zombie apocalypse. David Gaider recently posted a list of the 10 games that most strongly influenced him. I thought that sounded like fun, so I put together a list of my own! As someone working in the industry, and an avid gamer, what would you say are the games that influence the way you think about games today? The ones that have stuck with you, and which you hold up as the bar—either for their story, their gameplay, or their sheer fun factor—by which you measure other games you play? Gaider's list includes only pre-2000 games; my own spills slightly past that, but due to how the question is framed, it still skews slightly older. Ranking these was hard and should be taken with a massive grain of salt. With no further ado, here we go! Civilization. As with David Gaider, I'd hold up the fourth entry (along with Fall from Heaven 2) as the best, although 1 and 2 were probably more personally formative as they were my main introduction to turn-based strategy games. Furthermore, they were the first commercial games I ever modded, and I gained a deep appreciation for the wonderful new life that could be injected into good games when developers made core files available in easily-edited and easily-extended formats like plain text, XML and unencrypted image files. Baldur's Gate 2. While it traded away the open world freedom of the Ultima series and the exploration element of its own predecessor, it more than made up for it with the astonishing depth of its characters and plotlines. The Viconia romance still haunts me, and the Aerie romance still cheers me; those were the first times I'd encountered this sort of player-directed romance in a game, and I have yet to find anything as compelling in a non-BioWare game. And, of course, the core systems are just fantastic, rewarding careful planning and execution of combat while also allowing for a tremendous variety in the ways you build your character and party. Planescape: Torment. Man, this game is so good on so many levels. It's probably the most literate game I've ever played, combining both an incredibly deep story and an astonishingly broad range of ways to roleplay your character. What I love most about it, though, is the way it upended my assumptions about how these sorts of games "should" work, utterly destroying fantasy RPG tropes and inverting the way I typically played these games. After being trained to always protect my PC and sacrifice my NPCs in Baldur's Gate, Planescape got me to do the opposite. I also continue to be impressed at how relentlessly dark this game allowed itself to be, without even the patina of gallows humor that I would have expected. Hero's Quest. This was the first truly graphical game I played, and probably the one that made me first fall in love with gaming. It also introduced me to the adventure game genre and the RPG genre. Much of the referential humor went over my head at the time, but I still found plenty to chuckle at, along with some surprisingly dark sections. This game brought together exploration, combat, classes, skill advancement, economy, and many other elements that I take for granted today. 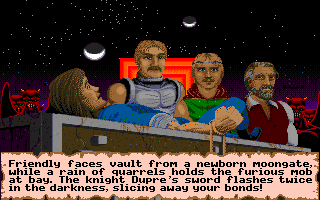 The later Quest for Glory games were good as well, but also grew more linear. I used to dream about how wonderful it would be to just live in Spielberg, enjoying the beauty of Erana's Peace and the waterfalls and dryad forest and all the colorful townsfolk. System Shock 2. In my opinion, this game has the most effective sound design and the scariest villain ever created in a video game, even fifteen years later. The BioShock games crib heavily from the playbook they perfected here, but for my money, this remains the definitive reference for how to terrify players by manipulating sound and integrating it into the environment. Plus it had a cool story, impressive plot twists, and a really excellent RPG progression system that the later BioShock games largely ditched. Grand Theft Auto 3. As you can probably tell, I love open-world games, and GTA3 was a revelation to me: I finally realized that it was possible to have an open world in a game that wasn't an RPG and not set in a fantasy world. As in games like Ultima VI, I loved the unstructured fun of just wandering around, poking my head into random places, gradually building up my mental map of where things lived. To me, GTA: San Andreas is the pinnacle of the franchise, but GTA3 was the one that shocked me out of some long-held ideas about video game genres. Maniac Mansion. It's really hard to pick a single LucasArts adventure game, but this was my first exposure and the one that's stuck most firmly in my head. They had wonderful humor, baffling-yet-logical puzzles, and a deep commitment to whatever strange world they had created. I was excited to discover that the game included multiple endings, some of which I didn't find out about until years later. I also remain impressed by what they were able to do with a multiple-character "party" in an adventure game, as well as the really-well developed Ed/Meteor family. ICO. One of a handful of precious games that I value for their ability to instill a feeling of empathy in me. The game managed to do it with virtually no dialogue, but a really novel use of several other tools at its disposal (most memorably the vibrating controller, which did a surprisingly good job at simulating the pulse of a young girl you were leading by the hand). The core gameplay was solid, and the visual design breathtaking, but I'll most strongly remember the profound sense of responsibility I felt towards protecting Yorda. Shadowrun, specifically the SNES game. I had a mind-blowing epiphany moment when I was able to acquire a ticket to enter The Cage, sidled past the troll bouncer, then advanced to a soundstage, the music growing louder, as lights and pyrotechnics flashed around me, watching couples grooving on the dance floor, while Maria Mercurial stood triumphant at the front of the stage, belting out her song. It broke down the division I'd unconsciously been maintaining between the real world and the game world: games didn't have to portray fantastic otherworldly spaces and actions, they could also include aspects from our actual lives and experiences. Shadowrun was also my first-ever exposure to the cyberpunk genre; it would be many years before I continued my exploration of ICE and chrome, but it remains my baseline for grim techno-futurism. That's it! I'm sure that if you asked me again in a year this list would shift around somewhat, but all of these are games that live near the front of my brain, ready to be invoked whenever I am complaining that some more modern game has fallen short of the high achievements of the past. I know, I know... I'd directly said before that I never planned to re-play Dragon Age 2. Well, guess what? That's exactly what I'm doing! It's kind of a slippery slope. I started thinking about it because of [redacted]. I'd recalled that the two DLC campaigns (particularly Mark of the Assassin) were dense in content for companions, and thought about bringing back Selene to take a new group through each one, making different choices along the way and also entirely new sets of banter. So I loaded up my last save, only to realize that (of course) you can't play the DLC more than once per game. The logical thing to do, of course, would have been to load an earlier save; after all, I'd put these off until right before the final quest sequence, so I would still be at a good max level for it. But that got me thinking more: each DLC can be played at almost any time during the game, from very early on in Act 1 all the way up until the end of the game; and because that covers such a long stretch of in-game time (I think about 6 years), a decent amount of the dialogue seems like it can be modified based on Hawke's status and what's happened in their life. But, if I was going to play the DLC from earlier in the game, then maybe I should go ahead and roll a new Hawke, just to make it even more different. And one thing led to another and, well, here I am playing through the whole game again. And you know what? It's pretty fun! I'd been concerned that, given some of the well-documented issues with DA2 (recycled environments, human-only player characters, limited follower customization, etc. ), any replay I attempted would be far too similar to the first; and, given that the first time felt pretty repetitive, I doubted I would fare even that well on a second attempt. But, in case you ever want to do the same thing, here were some changes that ended up switching things up very nicely. Change your class. By now, it's become a bit of a cliche: I play an RPG the first time as a rogue, and the second time as a mage. This has a profound effect on the game: not just flavor dialogue, but significant changes to plots and companions. Change the difficulty. I bumped up from my standard Normal to Hard. (Avoiding Nightmare, which I've heard is ludicrously overtuned and unfun in DA2.) The majority of combat is still stupid, but at least I need to pay some attention to it now. That's occasionally aggravating, but does at least change up the pace from my first game. Change your personality. I'd initially played as a strongly diplomatic Hawke; this time around, I deliberately skewed towards Sarcastic. This does make an interesting archetypal shift, as I usually play diplomatic/good Mage characters and more chaotic/sarcastic Rogues. 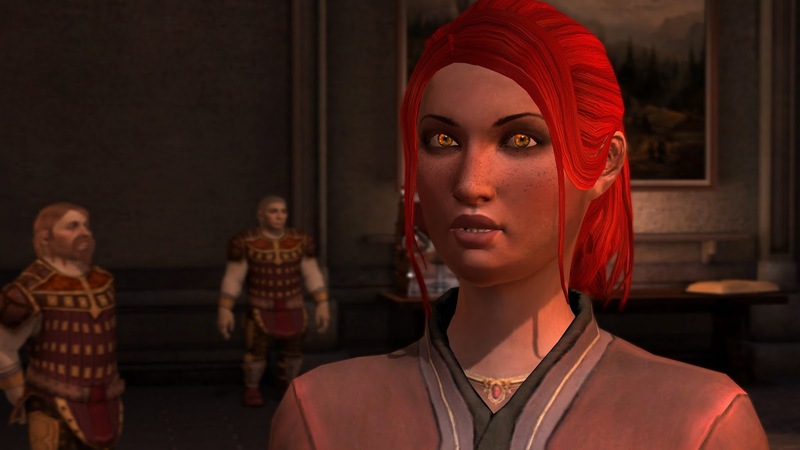 Even though the same voice actor is used for Hawke, her delivery is very different across the different tonal archetypes, and so to a large degree it sounds like the same character. Change your romance. In my first game I'd dallied about with both Isabela and Merrill before choosing the latter. This time around, I zeroed in on Isabela from the beginning and gently friendzoned Merrill. I was interested to note that I could still have a rewarding game while not changing some aspects about my first playthrough. Gender. I've heard that male sarcastic Hawke comes across as extremely douchey, and I didn't want to play as an Aggressive personality, so I decided to stick with a female Hawke. As noted above, she had a great delivery for this role. Major story points. I basically played as a "good" character for both games, and ended up making most of the same major decisions. But, by switching up other character elements, these played out in subtly but significantly different ways. Companions. I'd initially planned on a significantly different standard party, centered around building Isabela as a rogue tank. It's an interesting concept, but ended up requiring too much micromanaging, plus the greater difficulty of combat gave me less leeway to run with a sub-optimal party. So, I ended up running with the exact same party as my first game: Aveline tanking, Merrill destroying everything, and Isabela doing focused single-target damage. BUT, combat ended up playing out very differently, as I'll discuss below. Quest ordering also made a pretty significant difference. My general approach for as long as I've been playing RPGs, from Hero's Quest all the way through to Skyrim, has been to first visit a city; wander around and talk to everyone, collecting all the available quests; then head out into the countryside and make a circuit, solving each quest on my list while minimizing backtracking; then returning back to town, collecting my rewards, and repeating with the next round of quests. That generally works well, and is a good way to stay focused on the main progress of the story while minimizing the time spent traveling. But, given DA2's heavy use of recycled environments, this can often mean not only playing through the same cave map four times, but playing through it four consecutive times. So, this time around, my general approach was to focus on solving each quest almost as soon as I got it. I mean, if I went to Hightown then I would certainly talk to multiple people and pick up multiple quests; but right after that I would head out to the surrounding coast and start rescuing folks. This nicely breaks up the monotony, since your visits tend to look like Kirkwall-Cave-Kirkwall-Cave-Kirkwall-Temple-Kirkwall-Coast, instead of Kirkwall-Kirkwall-Kirkwall-Coast-Temple-Cave-Cave-Cave. And, since there's fast travel everywhere, it's not like you're really spending much more time doing things this way. On a somewhat-similar note, I decided to switch up my approach to the DLC. In my first game, I saved both Legacy and Mark of the Assassin until right before the end of the game. There's a certain sense to this, since the equipment you get in the mods is leveled, so the longer you put off acquiring them the stronger they'll be. But, on the other hand, I found that the Champion Gear from Act 3 and the outfits from both DLCs are all roughly equivalent, so there isn't that big of an advantage; I replaced my Champion gear with Warden gear, then immediately replaced that with Assassin gear. So, I figured, it would be better to split them up. I decided to play one of the DLC partway through Act 2, particularly since I had learned from the wiki that I wouldn't be able to complete my Armor of the Overseer set until Act 3. I did this by putting off the Main Quest entirely, completing all companion and side-missions; then doing the DLC; and finally returning to the main quest (which in turn will unlock some later side-missions). This gave me a really nice break between some of the repetitive quest environments. But, which DLC to play? In my first game I had played Legacy and then MotA, mostly because that's the order in which they were released. This time around, though, I decided to do MotA first. My main motivation was rather petty: I thought that the armor from that game was much uglier than either Champion or Weisshaupt gear, and wanted to save the nicer-looking stuff for the endgame sequences. Well, I had forgotten that, of course, as a mage I'd be getting different armor than my rogue had. The mage gear ("Enchanter Illana") was slightly more interesting, although I was bummed to realize that it looks virtually identical to the "Armor of the Overseer" set that I would complete early in the beginning of Act 3. It's a rare instance of MotA being cheap and repetitive instead of delighting me with new stuff. Let's talk about combat now! Besides being at a higher level of difficulty, fights played out quite differently this time around. My first game often featured three melee fighters (Selene the dual-wielding rogue, Aveline, and Isabela) and just one character with AOE (Merrill). This time around, Faria Hawke was a Force Mage who early on mastered the Elemental tree, so pretty much all of her spells had some AOE component, from narrow effects like the upgraded Winter's Grasp to the battlefield-encompassing Firestorm. I repeated my earlier successful experience with Merrill's blood magic, with its devastating Wounds of the Past and a punishing Tempest spell. As a result, I've had an almost opposite experience from my first game in terms of which fights are easy or hard. My original party excelled at taking down single targets, so it was devastating against boss creatures and fights with a few powerful foes. Particularly against scattered ranged enemies, we could split up, each engage an archer to keep them from unleashing ranged attacks, and then burn them down. But I had a harder time when getting swarmed by a large number of weak enemies: particularly if Aveline couldn't maintain threat, my glass cannons would get dinged to death by the massive number of bodies on the field. In contrast, large-numbers-of-weak-enemies are by far my favorite enemies in the current game. With Firestorm, Fireball, Maker's Fist, Wounds of the Past, Tempest, Entangle, Chain Lightning, etc., we have tons of tools at our disposal: any one or two of those will wipe out any trash on the field, and we can stack a few more to wipe out regular-strength enemies. Now, where I have the most trouble tends to be against single, powerful foes. Since AOE deals the same amount of damage per enemy, the total damage output against a single foe is a tiny fraction of what it causes a large group, so my biggest hitters do relatively little damage here. Isabela would be my best bet, but unfortunately I still haven't Maker's Sigh'd her abilities from an earlier tank/controller build, so she doesn't do as much straight-up damage as I would like. Fortunately, Aveline can almost always focus enemies' attention on herself, so even if we aren't terribly efficient we can still usually triumph on our fights. Speaking of companions: having foreknowledge of the game's outcome has affected my relationship with several companions. In my first game, I really wanted everyone to like me and always pushed for Friendship outcomes, even if I needed to reload and repeat certain dialogue scenes to get it. This proved fairly difficult, though, particularly for Fenris, who ended the game deep in the Rivalry zone but not fully-rivaled. This time around, I was able to max out most companions' Friendship by midway through Act 2. However, I deliberately rivaled several characters in the game. Fenris was obvious: I'm very sympathetic with his plight, but I knew from experience that trying to maintain a friendship while supporting the mages was a non-starter, so I deliberately pushed for rivalry as soon as possible. I also rivaled Carter, pretty much just for the heck of it. I kind of resented that he wasn't Bethany, and given his general hostility I thought it would be harder to max his Friendship. I didn't quite max his rivalry ending up just about 5 points short, but I don't think there's an in-game impact for this. The weirdest shift was rivaling Anders. This was by far the most out-of-character thing I did: it's me, the player, with fore-knowledge of what Anders will do that made this decision, rather than my in-game character. Essentially, I wanted to make sure he wasn't my friend before he made That Decision, so I wouldn't feel quite so betrayed and could achieve a greater psychic distance between my character and the perpetrator. I was reminded of just how incredibly sympathetic Anders' position is, particularly in Act 1. It's almost impossible for me to disagree with him, so I had to be very careful in how I approached his relationship: I never brought him along on any missions where I would be openly pro-mage, only the few where I would aid the Templars. More than that, though, I racked up the rivalry by being as big of a jerk to him as possible: rudely turning down his advances, belittling his actions, just generally showing disdain to him personally and a lack of concern about his issues. It was really hard! I don't think I've ever roleplayed that big of a jerk before in an RPG where I had the choice. But I had a simple goal: max his Rivalry ASAP to lock it in, so I would then have the freedom to modulate my relationship with him as I wanted for the rest of the game. The results have been fascinating. I don't have many other points of comparison since I've never seen, say, a rivaled Varric, but rivaled Anders is a very different character from a befriended Anders. He's even more bitter, but less self-righteous. Most significantly, he surrenders more of his agency to Justice, who ends up taking a bigger direct hand in the events of the game. It's an interesting mode of storytelling, something that's used very frequently in games like Fallen London when they want to have fixed events that must canonically happen, and so give you a great deal of leeway in determining what actions led up to that event and how it was perceived by your character and those around you. I'm not gonna write much about plot stuff, since it's basically the same as before. But, for some bizarre masochistic reason, I went ahead and did another full set of albums for this game, although at least this time I didn't bother captioning every single one of them. Anyways, here's Prologue/Act 1 and Act 2. I'll do Act 3 and the DLC with a future post. Thanks to the delay of Inquisition, I'll have plenty of time to finish! Here's a little grab-bag of items that don't seem to merit their own blog posts, but are still interesting to me! I attended the midnight release party for Haruki Murakami's new book, Colorless Tsukuru Tazaki and His Years of Pilgrimage. Like the last release party I went to for 1Q84, it was hosted by Green Apple Books; unlike last time, it was held in their brand-new Inner Sunset location instead of their classic Clement spot. It was a really fun event! The new bookstore looks (and smells) wonderful. They're sharing the space with the video store that used to have the whole building, but have built it out for themselves, with extremely tall ceilings and a great use of space. It was a good turnout; I'm bad at estimating crowds, but I'd guess somewhere around 200 folks showed up. Even though the footprint of the new store is much smaller, it seems to be more open, usable space, and so it didn't feel quite as cramped as the 1Q84 event had three years ago. They did a great job at running the event, including some competitions like a Mad Libs twist on Murakami passages and a trivia contest; the winner of that one correctly answered 7 out of the 15 questions! I do kind of miss the Sapporo beer from last time, but there was still a really nice spread of snacks and drinks. The vibe was really interesting. Reading is such a solitary activity that we pursue in isolation, and a touchstone moment like this is one of the few times that readers emerge from our shells and socialize with one another, bonding over our shared love of something we each experience individually. It's kind of a weird juxtaposition of stimuli, though... the streamers and buckets of beer say "party! ", while the stacks of books say "you're in a library, please speak quietly!" Everyone seemed to have a good time, I got to chat with some new folks and old friends, and I even walked away with a signed copy of the book. I'm batting two for two and loving it! In other reading news, I'm approaching the end of Alan Moore's run of the Swamp Thing. I don't think I'll give that a full write-up, but will mention that I've really enjoyed it. It's much more of a horror book than I had expected, and gets really shockingly macabre at times. The series started before DC started its Vertigo imprint (and, if I remember correctly, it started Vertigo largely because of the rise of mature stories like Swamp Thing), and it can be far more gruesome than even titles like Sandman or Transmetropolitan that later ended up on Vertigo. But, of course, Swamp Thing isn't mainly remembered for its very effective scares. Even today, it feels fresh and revolutionary; at the time, it must have seemed mind-blowing. It's all the more impressive that it manages to be so creative while working within the constraint of following a character who Moore didn't create in the first place: but, Moore completely tears down the Swamp Thing, acknowledging everything known about him up until that point, then rebuilds him into an entirely new creation. The story becomes thrillingly abstract for long stretches of time, dealing with timeless themes and celebrating concept like patience and acceptance. It always seems a little jarring when, say, Batman shows up for a crossover issue. Swamp Thing seems incredibly far removed from the standard superhero plots of hero-versus-villain. The influence of Swamp Thing on Sandman is abundantly clear. Preludes and Nocturnes, in particular, with its many experiments in horror, seems to draw inspiration from Swamp Thing (even including an indirect crossover in the person of John Constantine). I've also recently read Miracleman, another Alan Moore title that has finally come back into print after decades of legal wrangling. Miracleman also shares many similarities with Swamp Thing; however, Miracleman and Sandman have almost nothing in common, which is interesting... the transitive property isn't particularly strong in comics. Miracleman is a bit like Swamp Thing (and I guess technically Sandman for that matter) in that it's a reboot of an established, classic, but not-very-popular comic-book character. I'm a bit fuddled by all of the intellectual-property controversy around the title, but I think the character was initially known as Marvelman, and was changed due to copyright reasons or something. Anyways, that's not important. The Marvelman book starts off with a perfect pastiche of a 1950s comic: the very two-dimensional art, static images, confidently bold exclamations in speech bubbles, and so on. These lay out the story of the Miracleman family, focusing on an incident when they repel an invasion from the future. The content of the story itself isn't quite as intriguing to me as Moore's other stuff, but I think this is another case where it was much more important at the time it came out; it can be hard to recognize sources of innovation when you've grown up in a world influenced by that innovation. Miracleman seems to do a particularly good job at accepting the tropes of the superhero comic (secret identity, rivalries with supervillains, assisting a mundane civilian populace) and dealing with them as if they were real problems (can two people of vastly different status share a meaningful relationship? does the government have a right to manipulate in order to serve a greater good?). The book also includes a really interesting set of comics that deal with the Warpsmiths, a bizarre and very alien interstellar race. They remind me a bit of some similarly strange outer-space races that Swamp Thing encounters late in his story. So, yeah... Miracleman isn't quite as mandatory as Moore's other work, but is still definitely worth checking out for anyone else who enjoys his writing or is interested in the history of comics. I'll probably pick up the second volume after it comes out later this year, and hopefully continue on to the stretch that Neil Gaiman wrote. Speaking of comics: Guardians of the Galaxy is really, really good! Like almost everyone else, I hadn't even heard of these characters before the movie came out. Honestly, that might have helped. People already have preconceived notions about how, say, Spiderman or Batman are supposed to look and behave, and may get distracted or irritated if a movie strays too far from that baseline. But I have absolutely no idea how, say, Drax the Destroyer is supposed to behave, so the filmmaker has much more leeway in crafting the character to the movie and not the other way around. In any case: it was a really fun movie that combined beautifully imaginative sci-fi settings, quippy humor, and a strong sense of camaraderie and adventure. I think that's it for now. I'm about 200 pages into S and 2/3 of the way through a replay of Dragon Age 2, so expect posts on those in the not-too-distant future, as well as the Murakami. Cheers!